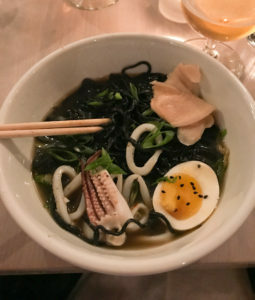 Local grilled squid ramen in green crab broth (Chef Matt Louis). Guests dined on delicious seafood caught that day on rod and reel by New England Fishmonger’s Capt. Tim Rider aboard the F/V Finlander out of Eliot, ME and prepared by chefs Matt Louis and Matt Decker of Franklin Oyster House in Portsmouth, NH on May 9, an d chef Mark Segal of Tinos in Hampton, NH on May 23. Capt. Tim Rider of New England Fishmongers demonstrating his gear. Guests heard why Capt. 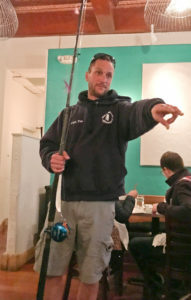 Rider motors up to 80 miles offshore to jig fish for groundfish, or why fishmongers are working hard to sell invasive European green crabs to restaurants. Guests learned about the changing landscape for domestic and global seafood from One Fish Foundation’s Colles Stowell, and why choosing local, sustainable seafood matters. 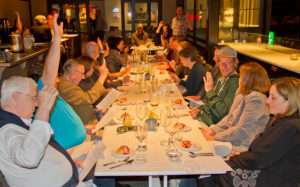 Proceeds benefitted One Fish Foundation and Chefs Collaborative. Read more about these fantastic events on One Fish Foundation’s blog (May 9 and May 23)!